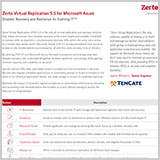 Zerto Virtual Replication (ZVR) 5.5 is the only all-in-one replication and recovery solution that makes enterprise-class disaster recovery to the cloud simple and scalable. Installable in minutes with no downtime, simultaneously replicate VMs within the same data center, to a remote data center and to Microsoft Azure. ZVR 5.5 introduces failback from Azure to enable a truly mobile hybrid cloud enterprise, all with the same recovery time of minutes.